I’m not saying it’s been cold in the mornings, but the lettuce probably would. Sean took this at the crack of dawn the other morning while they were waiting for the sun to rise high enough to defrost the lettuce greens. 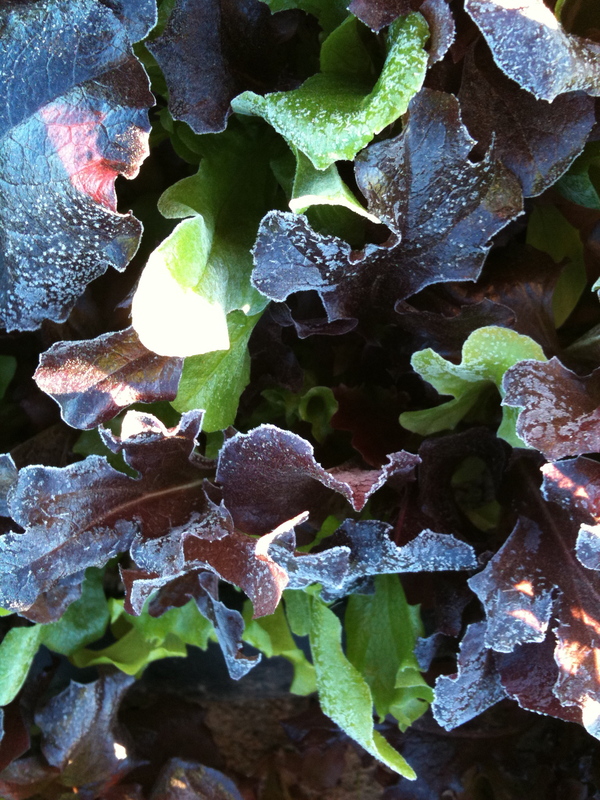 As pretty as it is, cold lettuce doesn’t like to be picked. It shatters at the touch when it is frosty. So we wait and let the sun rise and do its work first. On the other hand, a few more days like what we have had and the citrus will be ready. Side note: Payton Curry from Caffe Boa will be joining the McClendon’s Select crew at the Old Town Scottsdale Farmers’ Market this Saturday. We are so excited that he has agreed to come and help answer questions and share recipes and cooking ideas. He is a wonderful chef, and a great guy. You can read more about Payton from the profile the Arizona Republic published here. It is a really interesting article. We’ve been counting down the days until your citrus is ready. We send boxes to all our Wyoming relatives as their Christmas gifts since they don’t have easy access to citrus like we do. 🙂 There was a bit of a tussle over one box so we even added relatives to the list so there is enough to go around.